Tired of pounding those ancient manual staplers like a caveman?! Upgrade to the #1 Complete Electric Stapler Set! We back it all up with our Jam-Free and 100% Thrilled Customer Guarantee! ► Get yours, just Click "Add to Cart" NOW! 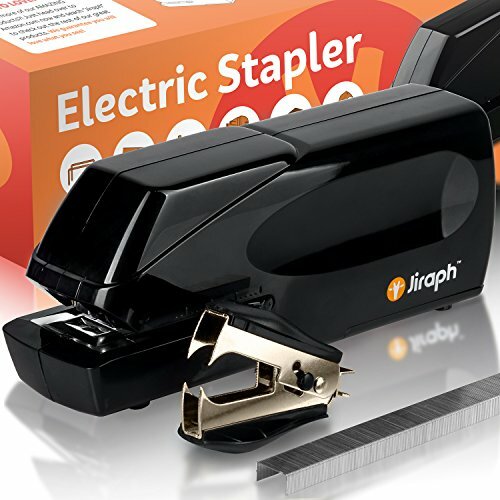 FULL STAPLING SET - Including the awesome, quick and quite electric stapler itself, a handy dandy staple remover, and to top it off, delivered fully loaded with staples so you are ready to go straight out of the gorgeous gift box! TRUE STAPLING WORKHORSE - With a Jam-Free Guarantee, and boasting a 25-sheet high capacity, and a heavy duty commercial grade build, you will never punch a manual stapler again and can now staple those papers day in and day out without batting an eye! WALL OR BATTERY POWERED - Want to plug in and set up your new automatic office stapler? Perfect! Need to move across your home and staple a bit here, and staple a bit over there? Well, thanks to the battery operated option you can now let your inner staple monster off the leash! 100% THRILLED CUSTOMER GUARANTEE - At Jiraph we implement a policy of relentless customer satisfaction. If for any reason you are not absolutely THRILLED, you are covered by our 100% money back guarantee. No questions. No Limits. No Problems. Just happy customers :) Click "Add to Cart" to get yours now! If you have any questions about this product by Jiraph, contact us by completing and submitting the form below. If you are looking for a specif part number, please include it with your message.